Discover Copacabana during your price guaranteed Bolivia vacation. All of our Bolivia tours have daily departures and are fully customizable. 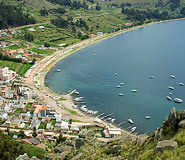 Copacabana is situated on the shores of Lake Titicaca, about 4 hours by bus north-west of La Paz. Many travelers stop off in Copacabana for a day or two, since it lies on the main tourist route between Bolivia and Peru. By road, the Peru-Bolivia border is only an hour away and the city of Puno in Peru is approximately 4 hours away. The small lake town is a lovely place to relax and enjoy Lake Titicaca, the highest navigable lake in the world and one of the most magical destinations in all of Latin America. 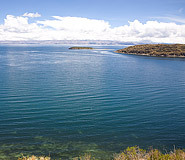 Copacabana is the ideal base for excursions to Lake Titicaca, particularly to Isla del Sol, the sacred Inca island. Although tourism has grown rapidly over the years, Copacabana has retained its quaint lake town charm. It’s a pleasure to explore the scenic walkways of this enchanting town, stroll along the lake shore, and relax on one of the many terraces as the sun makes its spectacular descent over the distant edge of the lake. Copacabana's many vibrant religious celebrations and traditional festivals are well known throughout Bolivia and the Andes. It is common for Peruvians to travel across the lake to attend these colorful festivities, many of which are in honor of the town’s patron saint, the Virgin of Copacabana. Sail Lake Titicaca. 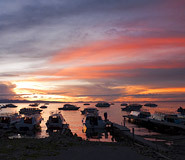 By far, Copacabana’s biggest attraction is the chance to sail on Lake Titicaca, the highest navigable lake in the world. Copacabana is a great base for island excursions, especially to the nearby Isla del Sol, which according to mythology, was the origin of the Sun God, Inti, as well as the birthplace of the first Incas, Manco Capac and Mama Ocllo. Isla del Sol is most famous as the site of the Temple of the Sun, constructed by the Inca Tupac Yupanqui in the late 1400s. Cruises across the lake are also a great way to travel to Peru, stopping in the major Peruvian city on the lake, Puno. City tour. The town is famous for its ornate Moorish-style Cathedral, the Basilica of Our Lady of Copacabana. The 17th century cathedral is home to a woodcarving of Our Lady of Copacabana, who is also known as the Virgin of the Candelaria and the Dark Virgin of the Lake, among other appellations. She is Bolivia's patron saint, credited for many miracles, and an object of worship throughout the Andes. Sculptured by Francisco Tito Yupanqui, a descendent of Inca royalty, the sacred image of the virgin has Aymara facial features and is dressed in ornate Inca robes. Also worth a visit is the Museo del Poncho to see colorful exhibits of Andean weavings and clothing. Copacabana is a year round destination, although the best time to visit is from May to October, when the days tend to be sunny and rain is infrequent. Expect to dress in layers, as the high altitude and strong sun result in very hot days, but high winds over the lake can be quite chilly and temperatures drop to nearly freezing after dark. The best hotel in Copacabana is the 3-star Hotel Rosario del Lago. Overall, accommodation is fairly limited and hotels generally have basic yet clean and comfortable infrastructure. Contact your travel advisor for more information.